Journal Reference: Romps D, A Charn, R Holzworth, W Lawrence, J Molinari, and D Vollaro. 2018. "CAPE Times P Explains Lightning Over Land But Not the Land-Ocean Contrast." Geophysical Research Letters, 45(22), 10.1029/2018GL080267. (top) The hour (UTC) in which CAPE x P maximizes in JJA. (bottom) Same, but for the lightning strike rate. How will the frequency of lightning strikes change with global warming? And, what explains the difference in lightning flash rates over land versus over the ocean? To answer these questions, we need a reliable proxy for lightning based on variables that climate models predict. This paper shows that the CAPE x P proxy for lightning – obtained by multiplying convective available potential energy (CAPE) by the precipitation rate (P) – faithfully replicates the spatial and temporal distribution of lightning over the continental United States. This opens the door to making detailed forecasts of lightning in both weather and climate reports. 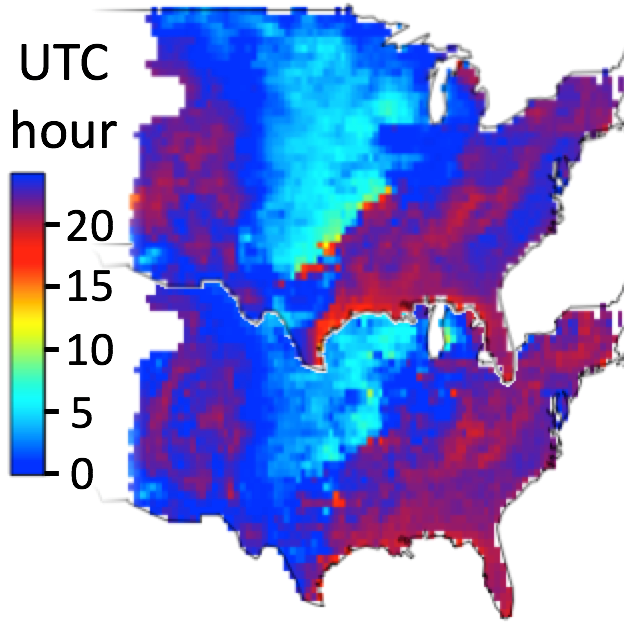 In an earlier paper, it was shown that CAPE averaged over the continental United States (CONUS) times CONUS-integrated precipitation (P) was an excellent proxy for CONUS-integrated lightning. That proxy was then used to predict changes in U.S. lightning due to global warming. But, that study did not test whether CAPE x P accurately predicts the spatial distribution of lightning or its diurnal cycle. In this study, eight different data sets are used to evaluate the performance of CAPE x P as a spatially and temporally resolved proxy for lightning (three reanalyses, three lightning data sets, a precipitation data set, and radiosonde data). It is found that the seasonal maps of CAPE x P over CONUS match the seasonal maps of lightning. In addition, CAPE x P captures the diurnal cycle of lightning; the figure below shows the timing of the maximum strike rate during JJA as predicted by the CAPE x P proxy and as observed from actual lightning. One might hope that CAPE x P could explain why the lightning strike rate is an order of magnitude higher over land than the ocean. The idea would be that the low heat capacity of the land surface would allow CAPE to spike in the afternoon, allowing the average strike rate to be significantly higher over land even if the diurnal-mean CAPE values are not much higher over land. This idea does not pan out, however: CAPE x P is not significantly different over land as compared to over ocean. Some other factor, such as aerosol concentration or boundary-layer depth, is responsible for the land/ocean contrast.